When you wish to store items for less than three months, that’s when you can opt for short term storage. The avenues for short term storage are many from boxes to canisters to containers. 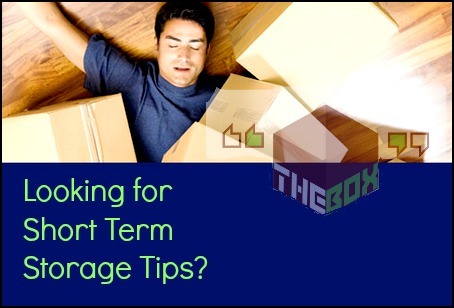 All you need to keep in mind is to follow these simple tips before opting for a short term storage option. 1. Opt for intensive packaging – No need to place large heavy covers on the containers as dust and moisture are unlikely to settle on the goods. Instead, concentrate on specific goods and keep them secured. 2. Treat soft and delicate items diligently – Soft and delicate items such as a show piece or a fruit syrup container need to be tackled with immense care. Wrap them properly in a paper and then place them in the big box that you will be carrying. 3. Keep a pathway for your entry and exit – Say your self storage unit is a room where you’ve kept all the containers and boxes. However, you at least need a place to walk and move amidst the things when the relocation time arrives. That’s the reason why you need to keep a small pathway for you to enter and exit comfortably. 4. Don’t give up on security – Even though we’re talking about short term storage, do not give up on security. Lock each and every item intensively as you would do during long term storage. 5. Label every product – You can find your stuff with ease if your label each and every thing you’ve put in the storage unit. After all, every product is important, right?